Both have transformations, powers, cats, battle evil monsters that use to be ordinary and something they are trying to protect. Good vs. Evil. Plot is somewhat different though. Based from the hobbies of the girls in the Suite Precure series, it could he said that the two anime both contain sweets. The original opening also has a somewhat similar melody to Yumeiro Patissiere in the opening phrases. For Suite Precure fans, if you enjoy making or watching sweets-making anime, then Yumeiro Patissiere is a definite recommendation. It would seem strange to compare these two anime but having watched Senki Zesshou Symphogear first, an instant recognition would be in the names Hibiki and Kanade. These could also be connected through the themes of music and song. Otherwise you could also consider them as mahou shoujo genre therefore, this could be a recommendation for those who like music themed animes. 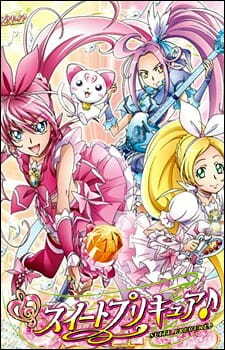 There are in my opinion 2 of the best series of the Precure Franchise. Both series target a young shojo public but the plot can even make an older public watch it. Also both have the same characters designer. Coincidence ? I think not. Both of these anime deal with music, so if you are looking for any Anime dealing with music, here you go. They are both in Pretty Cure Series, some storyline is both the same, but different theme and character. Also, in the movie, only the leader gets the upgraded form. If you ever watch Fresh and/or Suite Pretty Cure before, you will know what is the same.